Monks of the Theravada tradition live in accordance with the original monastic code, Vinaya. This prohibits monks from both handling or holding personal rights over money. Consequently, the finances of the monastery are stewarded by a charitable body, Harnham Buddhist Monastery Trust (HBMT - see below) - and are administered on a day-to-day basis by the Monastery Management Group and the Monastery Secretary , Penny Wakefield-Pearce. The Trustees are friends and supporters of the monastery, who serve in this capacity as an expression of their commitment to Dhamma. The main priority of the Trust is to ensure that the sangha, the monastic community, is sufficiently provided for in the form of a place in which to live and practice. However, the sangha itself also attaches a great deal of importance to helping lay people develop their practice. This includes providing opportunities to stay at the monastery during both formal retreats and individual short-term stays. In order to facilitate these ends the Trust has established a visitor facility, Kusala House. In 1984 the lay supporters of Aruna Ratanagiri, Harnham Buddhist Monastery, formed a charitable trust, the Magga Bhavaka Trust, as the body owning and managing the material assets of the monastery. In 2009 the Harnham Buddhist Monastery Trust (Company No. 6688355) was set up to succeed the Magga Bhavaka Trust (unincorporated charity registered No. 1126476) and became fully operational in 2010. Although constitutionally independent, this trust is closely associated with the trusts for the other Western monasteries of this tradition within the UK. Meetings are generally held three times a year and are open to whoever wishes to attend. There are seven Directors, lay people with varying backgrounds and experience, representative of different ethnic and geographical groups of supporters. 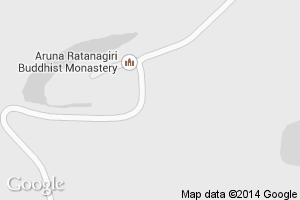 The monastic community at Aruna Ratanagiri is represented by Members who appoint and disappoint the Directors. The current Members are Luang Por Munindo and Ajahn Puñño. Trust meetings operate by consensus and are quorate with the attendance of at least two of the Directors and one of the Members. Myint Su: Myint Su first arrived in Scotland from Burma as a student in 1967. She has lived in Edinburgh since 1973 after returning to Burma for a short time. She has been an enthusiastic and grateful supporter of Harnham Buddhist Monastery after discovering its existence in the north of England. Having retired from previous careers, she and her husband Dr Clive Criper run a guest house in Edinburgh. Philippa Padbury: Philippa has been a supporter of the monastery since the early years of its development and has been a trustee since 1986. She is a qualified social worker and has worked in social care and research for the past twenty years. Mike Pearce: Mike and his wife Carole have been supporters of Harnham for many years. He worked for over twenty-five years in banking before taking early retirement to pursue academic interests. Kath Jones: Kath joined the Trust in December 2007 having supported the monastery for a number of years. Until retiring she spent many years teaching special needs children. Kath is married with four grown-up children, several grandchildren and lives in Stanley, County Durham with her husband. John Bower: John first visited the monastery in 2000 in connection with his studies with the Open University. He has been a regular supporter ever since and became a trustee in 2007. Paul Hansen: Paul joined the Glasgow Buddhist group in 2004, he has been a regular supporter of the monastery since 2007 and became a trustee in 2011. He works as a business analyst in telecoms and has been practicing meditation for just under ten years. Penny Wakefield-Pearce: Penny has been working as Office Administrator at Harnham since 2004, becoming employed as Trust secretary of HBMT in 2008. She has been inspired by, and a supporter of the Forest Sangha for many years, having previously lived near Cittaviveka Monastery in Sussex. The Monastery Management Group consists of the monastery secretary and two or three monks. They hold a formal meeting fortnightly to oversee and organize the daily running of the monastery. They have a list of contacts of volunteers within our extended lay community on who's help they can draw. or phone the monastery at 01661 881612. We are interested in receiving your comments or suggestions. You can also fill out a Harnham Helper's form and send it to us by email or post. We will then get in touch with you. In 2018 the running costs for Harnham Monastery totaled £81,348. Therefore it costs £6,779 per month or £223 per day to maintain the monastery and the community of eight to ten sangha residents. The lay facility of Kusala House costs at least an additional £600 per month. However some expenses for Kusala House, such as rates and sewage costs, are included in the Monastery’s running costs as they are paid together as one bill. It is the case that some expenses are only incurred when a donation has been given specifically for that purpose, such as the trees planted by the lake. These have not been included in the above figures. However more essential maintenance costs, such as the repainting of the kitchen, have been included, even though there was a specific donation to cover the purchase of the paint. If you have any queries regarding the running costs of Harnham Monastery, you may contact the Monastery Secretary at secretary@ratanagiri.org.uk.